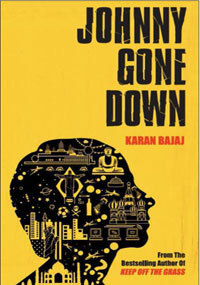 After the best-selling Keep off the Grass (which I had written about it an earlier post), Karan Bajaj is back with his second novel. Johnny Gone Down is about an Ivy League Scholar who had a bright future at NASA ahead of him but things seem to take a dramatic turn from an innocent vacation. The protagonist then partakes a series of adventures and the synopsis as given on the website leaves the casual interested reader like me, a tad confounded about what eventually would happen to Johnny. I’m waiting to pick this one up! Johnny gone down is an interesting really interesting read although a bit dark. Short review: if you haven’t read it, trust me and buy it. Longer one: I stumbled upon this book, while buying groceries. I had a look, since it was from unknown author, I didn’t spent extra time apart from reading the synopsis. The next time, I saw it in the hands of extremely good looking lady waiting at the airport. The third time, I was getting the information on ‘how to get your book published in India’. The final time, it showed up in the list of Indian reads from librarywala.com. I just ordered it. Previous Previous post: Market Research: 5 Learnings on conducting customer surveys! Next Next post: So, what does Gurgaon mean to me?